Tanadee Home Curtain, the Phuket’s exclusively leading curtain company, offers you a variety of high quality curtains for home decor. With a wide selection of products and services for all of your window dressing needs, we can provide abundant styles to decorate your windows. We are committed to serving modern and unique curtains in Phuket and aims to provide the exceptional services that meet clients’ need for home designs. Tanadee Home Curtain has a great number of products to compliment any decoration and made to measure quality curtains in Phuket. Our quality products include roller blinds, wooden blinds, woven wood, bamboo blinds, Roman blinds, Japanese folding door, vertical blinds, panel track, and Balinese curtain. In addition, we provide curtain equipment such as clip eyelet, hook, curtain rail, fashion rod, tieback, trimming, and curtain pole. When you need to buy curtains in Phuket, just visit Tanadee Home Curtain, then all you need for your modern and chic home decoration is in reality. 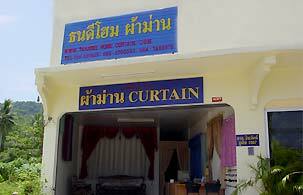 Fill up your home decoration with the best quality curtain in Phuket. Tanadee Home Curtain is all you need.